The German Bundestag is very late at electing a chancellor. 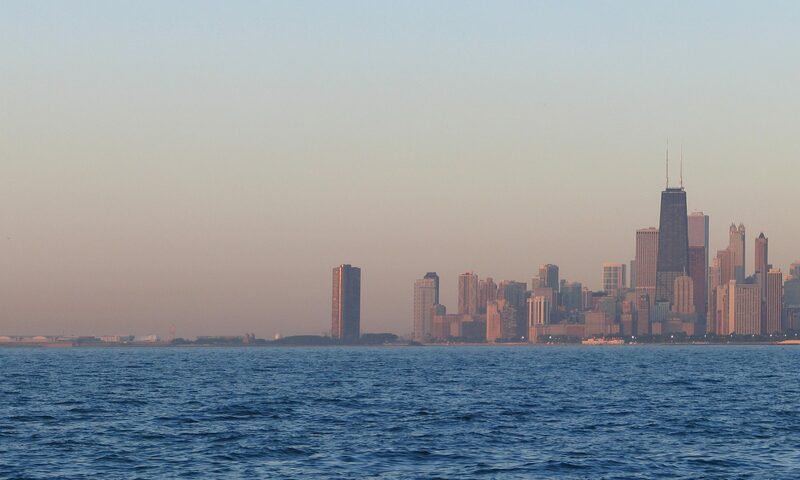 Here’s how late, exactly. It’s been four months (and counting) since the German Federal elections and the country is still without a new government. After the center-left SPD decided last weekend to enter formal coalition negotiations with Angela Merkel’s CDU and its Bavarian sister party, the CSU, it is still far from clear if and when the three parties will agree to form a new government. Already the SPD’s youth organization is rallying to prevent the party’s base from agreeing on a yet-to-be negotiated formal coalition treaty. And on the conservative side, tensions are mounting between those who view the results of the preliminary talks between the three parties as the final offer to the SPD and others who are willing to make yet more concessions to the social democrats. 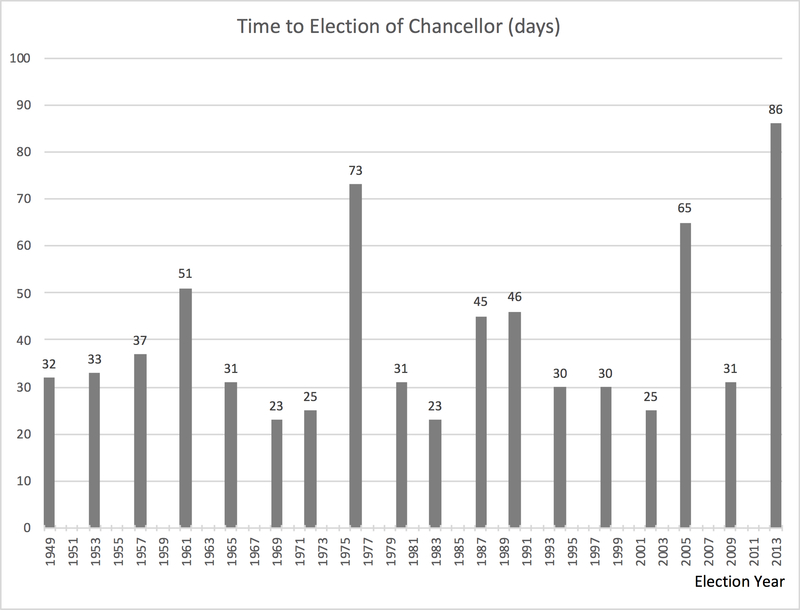 We used historical data on government formation in Germany and calculated the time it took in the past from election day to the election of the chancellor in the Bundestag. As a parliamentary system, German governments are not determined by the results of the general elections. Rather, government formation is left to the parties in the newly elected federal legislature. 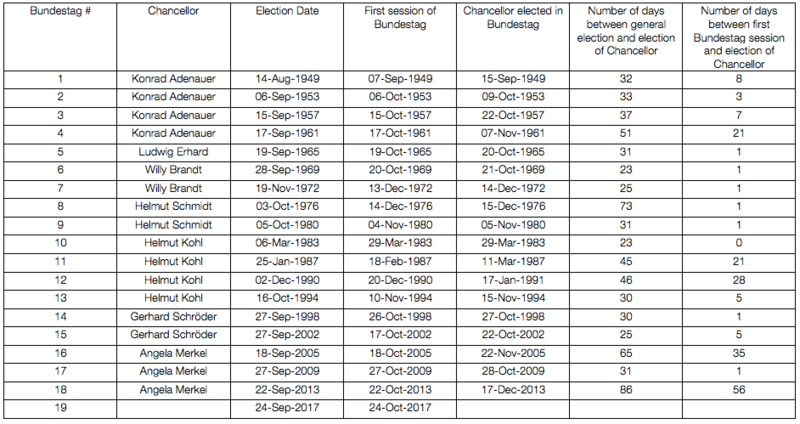 Looking at data from the 18 Bundestag elections since 1949, we found that, on average, it took the federal legislature just shy of 40 days (39.8 to be precise) from election day to the election of a chancellor. The longest it ever took before the 2017 elections was after the elections in 2013, when 86 days passed before Angela Merkel was elected chancellor with the votes of the CDU, CSU and the SPD. The German constitution gives the newly elected parliament a maximum of 30 days after the election to meet for a first session (Article 39.2 of the German Basic Law). Considering the time from the first Bundestag session to the election rather than the time between general elections and election of the chancellor, this time is just under 11 days. Again, at (as of today) 92 days since the first Bundestag session, the current situation is highly unusual. Barring any upsets by the social democratic party base, Germany should have a new government by Easter. Failing this, the beacon of stability that is the German constitution, still leaves to possibility of forming a minority government; an option that while generally not well regarded in Germany, has worked well for a number of countries, including Germany’s neighbor to the north, Denmark. It stands to reason that a minority government with the lively debates it requires to secure majority support for specific policies would be an option that is preferable to yet another grand coalition and its de-politicizing tendencies.